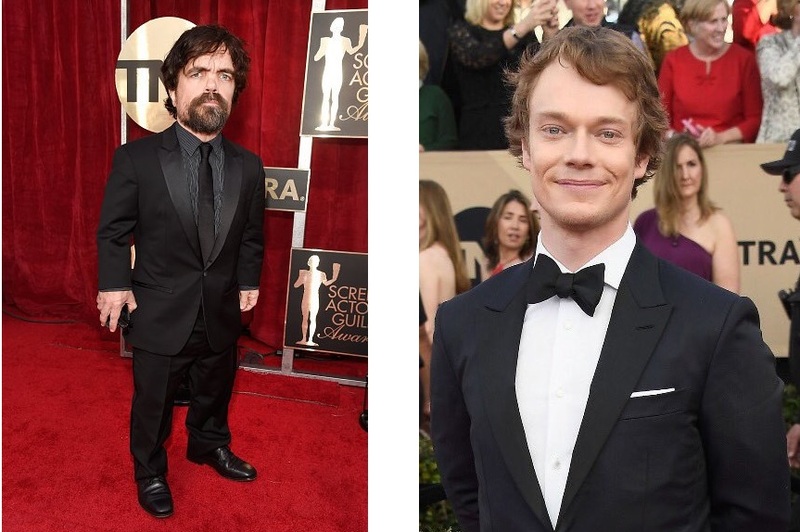 The cast of Game of Thrones turned out in style this evening for the 23rd Annual Screen Actors Guild Awards. The show was nominated for three awards, and the cast support was strong, with many GoT stars walking the red carpet. 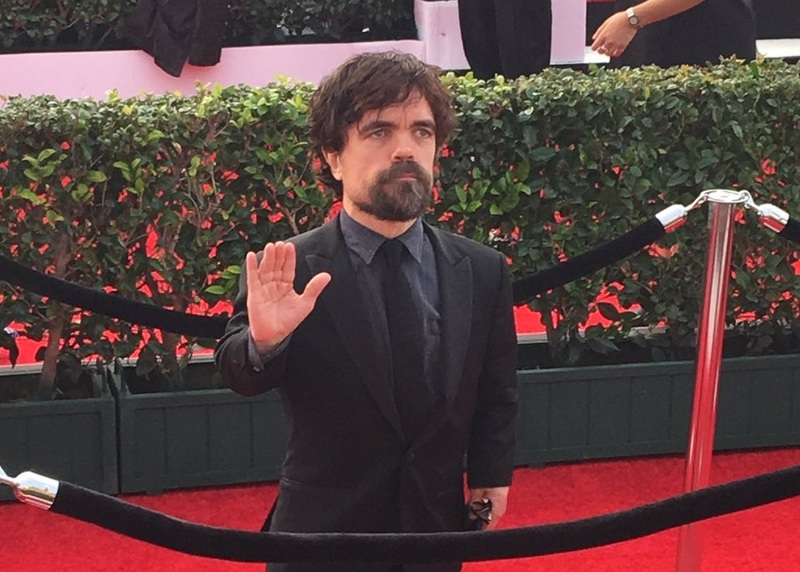 Game of Thrones kicked off the SAG Awards by winning a prize before the ceremony even began! Once again, the show snagged the prize for Outstanding Action Performance by a Stunt Ensemble in a Comedy or Drama Series, which is awarded from the red carpet. 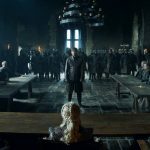 With the incredible work in season 6 on episodes like “Battle of the Bastards,” jam-packed with action and stunt players, it’s no surprise that GoT triumphed in this area. Game of Thrones also competed in the Drama Ensemble category, with the award going to Stranger Things. Peter Dinklage was nominated tonight for the Male Actor in a Drama Series Award, but lost to John Lithgow of The Crown. We’ll round up the best of the SAG Awards interviews tomorrow, and see what the cast has to say about the awards, their looks, and the new season of Game of Thrones! Seriously? Stranger things? Ughh… Overrated af. Stranger Things seriously?!! Ugh!!! Just happy GoT won for stunt performance at least! Battle of the Bastards had the best stunts for sure! I’m happy Stranger Things won because of the amazing acceptance speech! I also need someone to slow down that clip with alleged season 7 footage posted above. 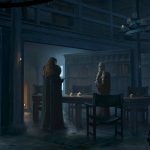 The Jon and Arya closeups look to be from season 6 and there’s also a shot of what looks to be Grey Wind to me. is that for real ? are we going to get a teaser trailer soon ? Not the Emmy Awards = nobody cares… to be honest. TV/media is working to make all these superfluous awards shows matter more, but they’re simply not at the same level. Sure, it’s great when (your) fan favorites win but one can just feel more external influence in the judjing. 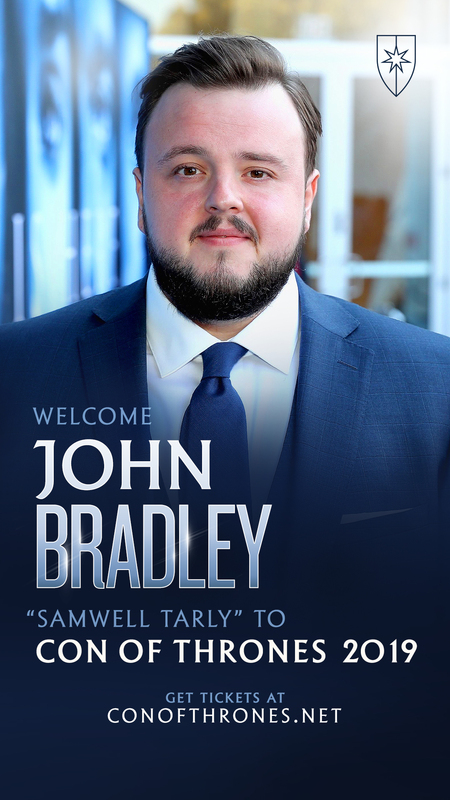 Only the Emmy’s like GoT. 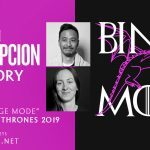 SAG awards do NOT like Throne’s ensemble. They only like their stunt crew. That’s it. And the Golden Globes can’t stand the show. And the Peoples Choice likes Outlandet and can’t stand GoT. I have a feeling the same thing will happen with GoT that happened with LotR: The awards shows will wait until the last season (last film in LotR’s case), and then it will sweep. As Flayed Potatoes noted, the “Stranger Things” win was worth it for the acceptance speech alone. (Better Half, a combat vet and military historian with a safe full of guns, was moved to tears.) 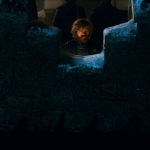 And as much as I adore Peter Dinklage… This season’s writing was not the best D&D have given him. On another note, I was thrilled with Mahershala Ali’s win for “Moonlight,” one of the most beautiful films I’ve ever seen, and with the unexpected big win for “Hidden Figures,” which a friend and I saw yesterday. Stranger Things was such a delightful surprise last year, and I loved seeing all the kids get trophies, even if I do hope the GOT cast is recognized before it’s over. Well, they’ve got two more kicks at the can. Plus, David Harbour unexpectedly gave the most rousing speech of the evening. Super-glad that Denzel stole a march on Casey Affleck, given the latter’s behaviour offset. The cast looked great, for the most part (Gwen’s look doesn’t work for me). Maisie’s is quite striking, particularly the lipstick, and Sophie’s Louis Vuitton contract finally yielded a more normal-looking dress. and Sophie’s Louis Vuitton contract finally yielded a more normal-looking dress. 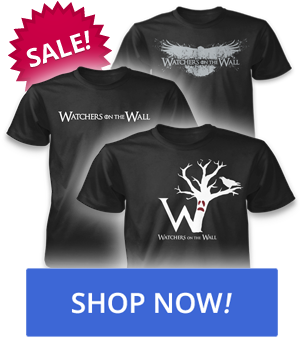 Winter may be coming but the Stark girls are hot as hell….damm, the just look amazing! They are serving some 1940 vintage realness and I’m loving it, it’s just flawless. That being said, did any of them talked about the new season of game of thrones or gave away something? Because they used to say very important information in the past, but I guessed it’s because the season aired earlier in the past *cryEmoji. Hoo boy, they may not have won, but the GoT stars were gangbusters for looks tonite. Maisie, Sophie, Nathalie–they’re havin’ a heatwave. I’d never seen Maisie look so 1940s femme fatale. Only fashion disappointment was Gwen, who looks a little like I do in pajamas when I wake up. I don’t get all the Stranger Things love. Its a fun series and the kids are cute. The acting was fine, but I don’t think they hold a candle to the brilliance of Peter, Lena, Kit, Maisie, Liam and several other GoT folks. Frankly, Millie gives me the creeps. 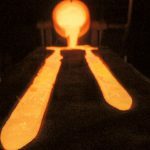 Are Kit and Emilia alergic to these things ? Seriously, the Stark gals are there, the Targaryen crew is there but Kit and Em are always missing from these things. Only time we get to see them is at the Emmys. wight hunt crew seems to be missing, Liam usually attends these awards. Who said they were filming in Norway ? That has to be inaccurate. Scratch that, looks like Liam was there as well. Well the girls are stunning as always … from the neck up. Really don’t like the dresses or Gwens ensemble- they look like they got dressed in the dark..Maisie’s looks Ok I guess. And seriously, what is wrong with these guys that do the red carpet interviews? Do they even have the slightest clue what they’re talking about? Some of them are just so mind-numbingly stupid I don’t know whether to laugh or be depressed ? Only fashion disappointment was Gwen, who looks a little like I do in pajamas when I wake up. Dude. You have WAAAYYY classier PJs than I do. 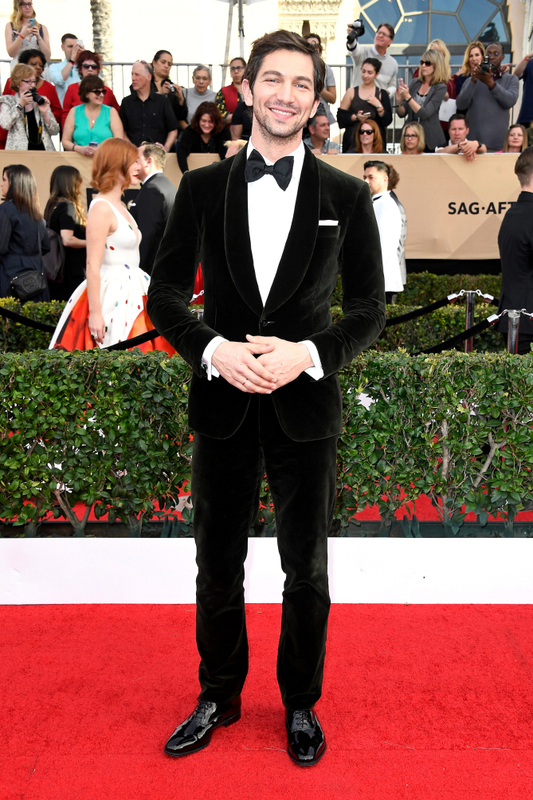 I love Michiel’s velvet suit! I think Sophie’s dress would have been okay if the shoulder straps had been either two thin ones or two thick ones – but then I’m conservative in regard to dress. I hate the wonky hemlines that have been in fashion these last few years and the t-shirts that are longer at the back than the front – and don’t get me going about those half-mast wide leg trousers that have been around the last year or so. 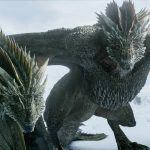 Irina Stark: Are Kit and Emilia alergic to these things ? They are always filming that is why they miss so many award shows. I am not sure of Emilia right now, but Kit was still spotted in Belfast on Saturday or Friday. Emilia might also be in Belfast, or perhaps she is preparing for the Han Solo movie. For the Golden Globes Emilia was in Belfast, and the crew arrived in Iceland on the Monday right after the awards, so the timing would not have worked for Kit. Both were at Emmy’s. I remember that during the previous award show and perhaps Comic Con, that Emilia was filming Above Suspicion and Kit was filming The Death and Life of John F. Donovan. I dont think they are missing these events on purpose, they are just often busy with filming during these award shows. Sophie and Maisie are at a fun age for these events, or perhaps not so much the award show itself but the media and the after parties. Both of their dresses looked good, but I did not like Maisie’s lipstick. 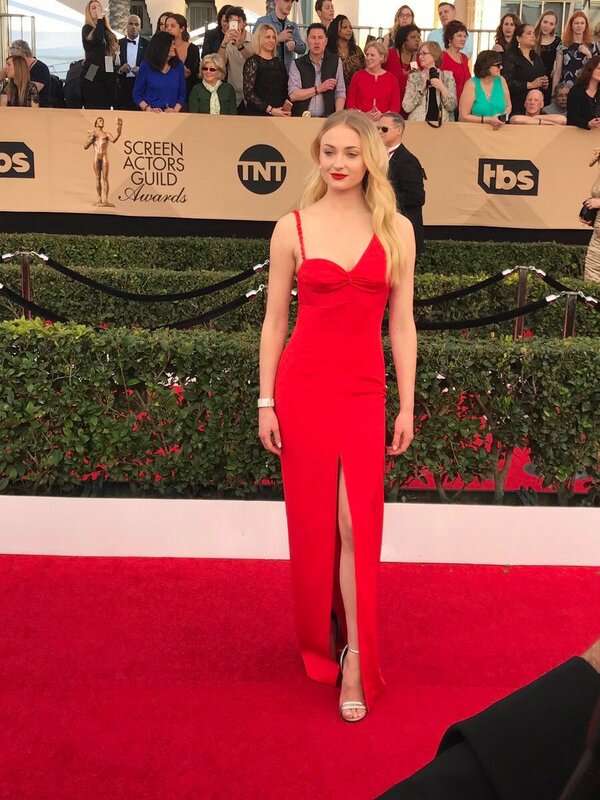 This is the best look that Sophie has had in a long while, she looks fantastic in red. Gwen has a very unique sense of style, unfortunately it is a style that does not work for me, I have never liked any of her dresses. But I am sure there are other people who might enjoy her unique sense of style. Sophie is a ambassador for Louie Vuitton now, that’s what this and her Golden Globe dress are so I imagine she’ll be wearing it from now on. The question is though is if she gets to choose her dress or has to wear certain ones now. I think this is the 6th year of nomination , surprised it did not win ensemble. The ensemble work has been the hall mark of the series. Figured it would get the unjustly-ignored-prize for a body of work over 6 years, as happens with the academy awards. Gee even Downton Abbey (with too many wins) and The Crown were better than Stranger Things, and I like Stranger Things. When I saw Michael aka Daario on the red carpet I was like What The Hell he looks like a different person without a beard, I just don’t know what to think of the change do I love it or hate it, I have no idea. I was thrilled for the Moonlight and Hidden Figures wins as well. Excellent movies. I also liked Denzel wining over Casey. I wish either Courtney B Vance or Sterling K Brown had won instead of Cranston (they probably split the vote), but overall the night was very enjoyable. The Sag Awards are probably my favorite award show. They always have good speeches and it helps that they don’t have a host. What was better, the speech or Winona Ryder’s expressions? 🙂 . I was ecstatic over Denzel Washington’s win over Casey Affleck as well. Is hidden figures that good? I’ll throw Gwen some wardrobe love: I think that jumpsuit is amazing. Jumpsuits are hard to pull off, but she’s got the figure for it. 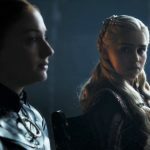 All the GOT ladies look great, but I’m not a fan of the asymmetrical necklines that seem to be everywhere these days. Nathalie Emmanuel’s look is a stunner. Stranger Thingss,ugh ! Overrated show is overrated,unoriginal story is unoriginal . Basically another take on ET and that’s pretty much it and before people say that i’m only attacking it because of GOT that is not the case,i watched it last year because a lot of people were acting like it’s the best thing since sliced bread and i ended up being meh about it . The production values and the child actors are good but other than that i really didn’t care about it . Totally agree with you!! I thought it was so cheesy! Only watched because like you, other people recommended it. Will not watch the next season….in protest for my GoT, which totally should have won! And because really not interested. I honestly really liked Hidden Figures. The cast made the movie for me. The women were particularly great! I don’t watch stranger things and I stopped watching walking dead after season 2 . For me it’s not about the fact that GOT hasn’t won but the fact that it’s a mediocre show . If Mr Robot won for example i wouldn’t have had a problem . See,the difference between me and book purists,is that i don’t go around Stranger Things related forums and sites bashing the show or the producers like an obssessed individual,i just say my opinion and move on . If i don’t like something i just stop watching . Stranger Things was better than Westworld and I like Westworld a lot. But Stranger Things has ‘seams’ problems and a little too much tap dancing. As I said I like Stranger Things. Of the nominees GoT is the best ensemble and has been from season 1. To be fair CSI has pretty much died after Cyber was a big flop,Law and Order is on it’s last legs,NCIS will be there soon and the Chigaco shows aren’t as popular as the old procedurals were so i think this fad will only last a few more years before they pull the plug . As for TWD,the less said the better . Yes its interesting how much police procedural that are out there .. I have yet to watch a complete season of CSI but on the other hand I have been fan of castle, mentalist, psych and bones and criminal minds and dexter ( don’t know I can put dexter in this list ) ..and i find out there are many more procedurals such as Rizzoli and Isles and rosewood …it amazes me how can they keep producing the same thing again and again ..they are all same procedurals but do the investigation and their making is different from one other..but my love for them is over I guess since most of the shows are ended or nearing their end ..mostly I binge watch the episodes on Sundays or during travels ..so its just my guilty pleasure its not like GOT or sherlock where I have to wait till one year for a premiere and watch evey episode as soon as it airs ..
Not just ET. Stranger Things is a mix of various movies/shows. Most notably Akira. ST is like an American kiddie version of Akira. 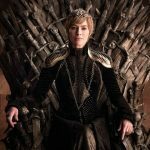 I’m okay with GoT losing to ST.
It’s about the only show that I enjoyed just as much as season 6 last year. I thought it was wonderful – a real love letter to my childhood that never felt laboured. Hadn’t been that hooked on a show since…well since season 1 of GoT. Never really got into Westworld. It was certainly thought provoking, but it just wasn’t cool enough for me. I guess the problem I have with Westworld always goes back to its initial concept as set up in Crichton’s novel – I simply don’t appreciate why all that money and technology would be invested in a ‘wild west experience’! As I am watching it, I am constantly thinking, ‘Yeah, but I can’t imagine that everyone wants to play cowboy. The other worlds would be so much more interesting – let’s see those as well’. I’m an unapologetic Stranger Things fan. While GoT was #1 on my preference list for Best Drama Ensemble, I was happy for their win. It’s difficult to compare a cast which is 7/16ths teenagers* (albeit very talented ones), to the seasoned vets of the other shows. *Noah is 12, and I’m not sure about the Demigorgon. 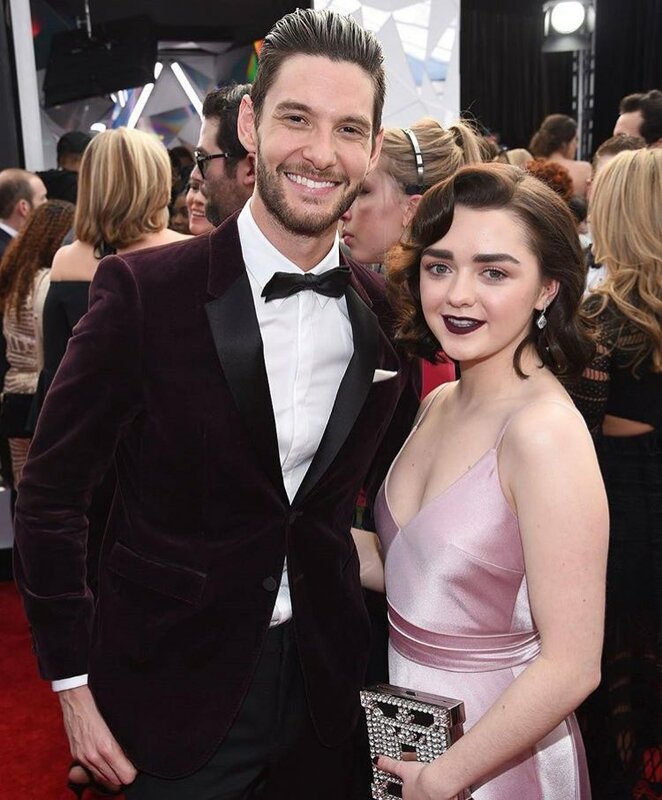 Back to Maisie’s picture with Ben Barnes. He looks so approachable. 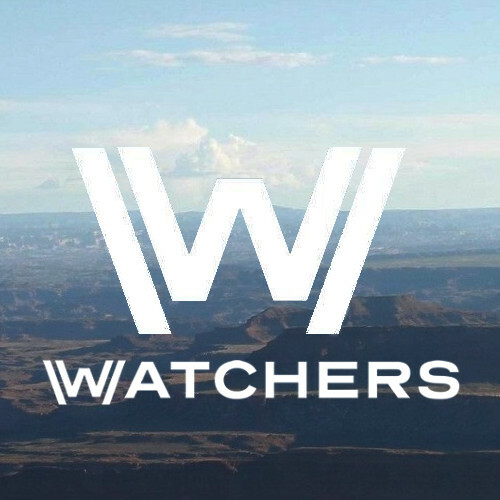 Logan, his character on WestWorld…not so much. Finally, loved the shoutouts to Nina Gold and Michelle Clapton from Claire Foy and John Lithgow. I think the GoT girls all looked great! Maisie lipstick tells us that she isn’t the young Arya Stark from Season 1 anymore. Nathalie looked stunning! They must both be busy. 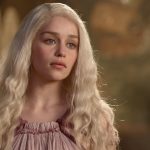 The Han Solo movie that Emilia is in, has just started filming. Also, it was announced yesterday that she has just won the starring role in Beauty Inside, which Fox 2000 won in a bidding war. She must be incredibly busy at the moment! She will have to start the press rounds for Above Suspicion soon. Sophie looks stunning with her beautiful blonde hair. I wonder how her ginger hair would have looked with that dress. Iam so happy for her ..
She is going to be really busy and which means she will again be not appearing in comic con …beauty inside is fourth movie ( han solo ,set it up and another with helena bonham carter ) she must be working.. apart from voice from stone and above suspicion which makes it six..
What a lovely colour on Sophie with her blonde hair! I’m not sure about the strap/wide shoulder combo but the dress is a definite improvement on that thing she wore a few weeks ago and shows off her gorgeous body to perfection. Love Maisie’s look, very 1930s/1940s Hollywood golden era glam (though the lipstick is maybe a shade too dark?). I didn’t like Nathalie’s dress at first sight but it’s growing on me, I actually quite like it. 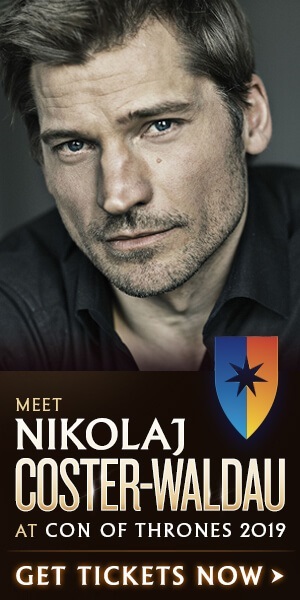 As someone said, it’s quite GoT-esque, somehow brings to mind Meereen. I love her hair and makeup, seems so natural and she’s so beautiful. The lovely draped gown Gwen wore to the Golden Globes was also Vivienne Westwood. I loved it; some people thought it was too pale with her pale complexion, but I agree with another poster here about her resemblance to an elegant marble statue. She was the face of one of Westwood’s ad campaigns for fall 2015/spring 2016.